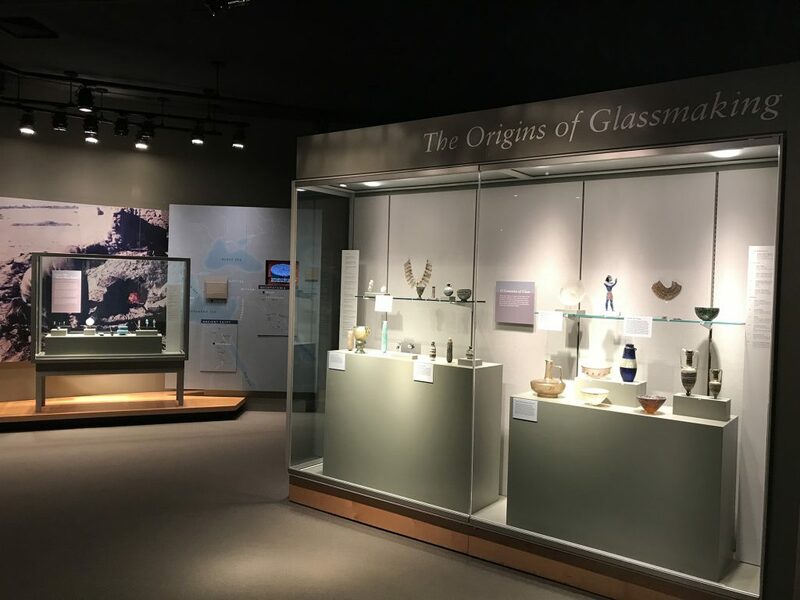 The case known as the “Primary Case” in the Origins of Glassmaking area is one of the first things visitors see when they enter the 35 Centuries of Glass Galleries. We know from visitor tracking studies and anecdotal observation that most guests and tour groups stop and look at this case. 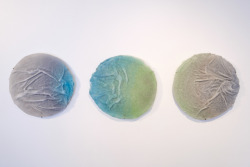 It serves as the introduction both to the gallery and to the history of glass. The Origins of Glassmaking primary case before updates. 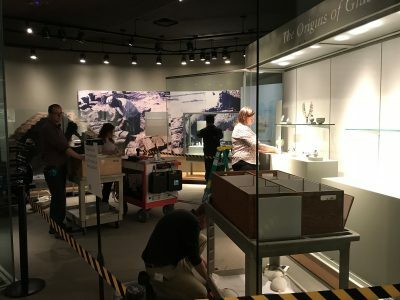 When I took over responsibility for the Ancient and Islamic Glass collection at the Corning Museum of Glass in summer 2017, I knew that one of the first things I wanted to do was to update the objects and labels in the Origins Primary Case. This case does a lot of heavy lifting: it introduces the first 15 centuries of glass history, represents almost a dozen ancient cultures, and showcases a wide range of glassworking techniques. Some techniques, like core-forming, were dominant for several centuries but eventually vanished. Others, like mosaic canes, persisted for thousands of years and are still used by contemporary glass artists. 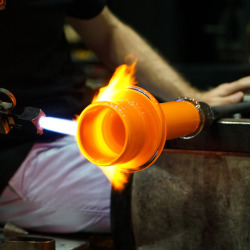 As a specialist in Hellenistic glass (the period immediately before the invention of glassblowing), I also wanted to draw attention to this important moment in glass history and its extraordinary products. January and February 2018: I spent a lot of time in the gallery, storage, and database selecting objects to move into the Primary Case. Because several of these objects had been exhibited in the back cases along the walls, I also planned how to update each of those cases. Permanent gallery changes are kind of like dominoes: when you make one adjustment, it can quickly cascade into a LOT more changes than initially intended! March: I met with members of the education department to review the object list and discuss what the labels should say. Because there are so many different types of objects in this case, we decided on short labels to discuss each group of objects, rather than one or two labels which would address them all. We also wanted the text to be as close to the objects as possible, so visitors wouldn’t have to look back and forth while reading. Here’s the layout I drafted using PowerPoint. This image served as everyone’s roadmap as we moved forward. PowerPoint layout for the Origins of Glassmaking. April–June: We paused on this project, since everyone was focused on getting the refreshed Crystal City Gallery and special exhibition Glass of the Architects up and running! 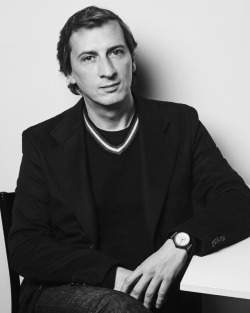 July: We conducted several intensive rounds of edits on the label text. I wrote the initial draft, which was edited by members of our education, registration, and publications departments. I also met with our preparators to plan out timing of object rotation and determine which objects needed new mounts. Many ancient pieces aren’t stable on their own, so they require brackets, stands, or museum wax to hold them upright and in place. August: I reviewed and updated the information about each object in the case, making sure that the names, dates, and place made reflect the most recent scholarship. The registrars checked and updated this information in our collections database. Labels were finalized and sent to graphics for production, and the preparators continued to work on mounts. Conservation examined the objects to ensure that they did not need to be cleaned or repaired. The Origins of Glassmaking primary case during updates. October and beyond: Now we are learning to live with the new installation and learning how successful it is. Docents and staff members are receiving updated information on the objects in these cases to share with visitors. Going forward, we will adapt our tours to better match the new objects and layout. 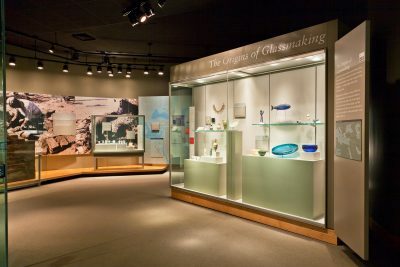 And we would like to conduct visitor feedback surveys and in-gallery observations to see if the changes help our visitors better understand and appreciate the early history of glass. The Origins of Glassmaking primary case after updates. 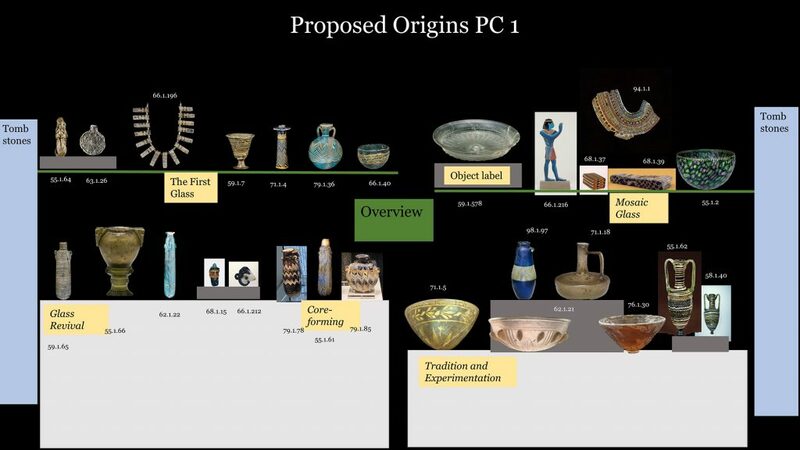 Stay tuned for Part 2, when I’ll give you a peek into why ancient Egyptians called glass “the stone that pours,” which is the topic of the updated case you can see at the left in the above image.